It seems every gardening book and nursery catalog refers to plant hardiness zones, also known as climate zones or growing zones. 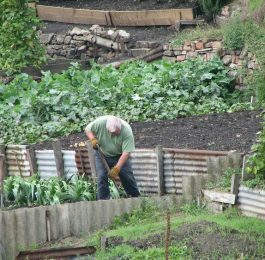 If you’re new to gardening, you may be wondering what all the fuss is with these zones, and how to find out which zone you are gardening in. Basically, plant hardiness zones are a guide to help you know which plants will grow where you live, so you don’t plant things that will soon die just because they can’t manage your region’s temperatures. Plants vary in the temperature extremes they can endure. Basic laboratory testing can determine the lowest sustained temperature a particular plant type can withstand, but, as gardeners, we still need to know how these measurements relate to our own gardens. In an attempt to answer this question, years ago botanists and horticulturists started gathering weather records throughout North America to compile a database to show the average coldest temperatures for each region. These records were condensed into a range of temperatures and transformed into various zones of plant hardiness. Maps were then made to show the lines between these temperature zones. The climactic studies and maps were undertaken by two independent groups: The Arnold Arboretum of Harvard University in Cambridge, Massachusetts, and the United States Department of Agriculture (USDA) in Washington, D.C. The two maps reflected some variances, but in recent years, the differences between the Arnold Arboretum and the USDA have narrowed. Today, the USDA map, which was last updated and released in 1990 (based on weather records from 1974-1986), is generally considered the standard measure of plant hardiness throughout much of the United States. Hence we have the USDA Plant Hardiness Zones. A similar map for Canada has been issued by the Canadian government’s agriculture department. So what’s wrong with plant hardiness zones? 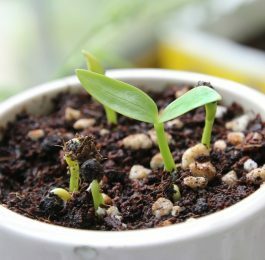 Well, just think about this: The average minimum temperature is not the only factor in figuring out whether a plant will survive in your garden. Soil types, rainfall, daytime temperatures, day length, wind, humidity and heat also play their roles. For example, although both Austin, Texas and Portland, Oregon are in the same zone (8), the local climates are dramatically different. Even within a city, a street, or a spot protected by a warm wall in your own garden, there may be microclimates that affect how plants grow. The zones are a good starting point, but you still need to determine for yourself what will and won’t work in your garden. How many zones are there? 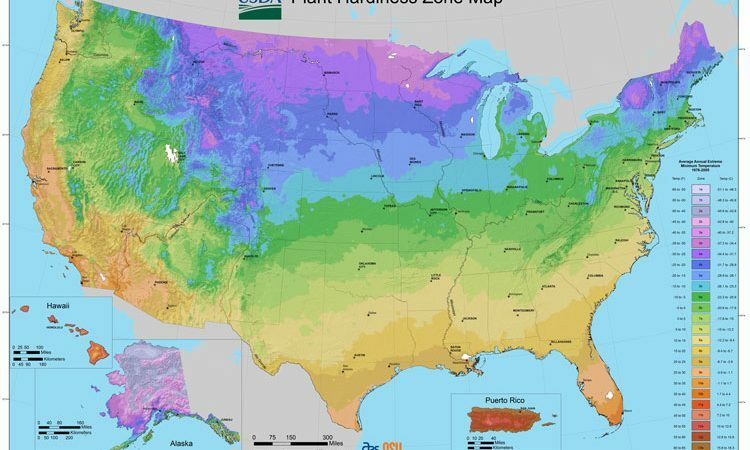 The USDA plant hardiness map divides North America into 11 hardiness zones. Zone 1 is the coldest; zone 11 is the warmest, a tropical area found only in Hawaii, coastal Southern California and southernmost Florida. In between, the zones follow a fairly predictable pattern across the continent, though a closer look will reveal scattered patterns of variations. Generally, the colder zones are found at higher latitudes and higher elevations. Plant encyclopedias may refer simply, for example, to “Zone 6,” which generally means that the plant is hardy to that zone (and will endure winters there), and generally can withstand all the warmer zones below. More detailed information may indicate a range of zones (i.e., “Zones 4-9”), which means the plant will only grow in those zones, and will not tolerate the colder and warmer extremes outside them. But remember, zones are only a guide. You may find microclimates that allow you to grow more than the books say you can; by the same token, you may find to your dismay that some precious plant — one that’s “supposed” to be hardy in your zone — finds its way to plant heaven instead. Enclosed is a list of references to inform you of your Garden Hardiness Zone. Web pages do change over time, but you should be able to find your hardiness zone on one of these links. If you have a better link, please let us know. Gardeners in the western United States sometimes are confused when confronted with the 11 Hardiness Zones created by the USDA (United States Department of Agriculture), because they are used to a 24-zone climate system created 40 years ago by Sunset Magazine. The Sunset zone maps, which cover 13 Western states, are much more precise than the USDA’s, since they factor in not only winter minimum temperatures, but also summer highs, lengths of growing seasons, humidity, and rainfall patterns to provide a more accurate picture of what will grow there. If you live in the western U.S., you’ll find that nurseries, garden centers, and other western gardeners usually refer to the Sunset climate zones rather than the USDA plant hardiness zones. In fact, the Sunset zones and maps are what are listed for each plant in Sunset’s Western Garden Book and Western Garden CD-ROM, which are considered the standard gardening references in the West. 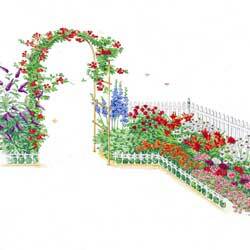 The American Horticultural Society has issued a Plant Heat-Zone Map. Click here for information about the map. You have to underställ the positive sitt usda zones. You also have to check monthly and average temperature, thermal growing session, hot or cool summers, first and last Frosts, amount och sunshine, micro climate in your garden. In de have so called garden zones from 1 to 8 and they are crap. THE best zones are 7b and even 8a in some places, and average yearly temperature of 7 to 8,6 degrees Celsius, 1700 to 1900 Sun hours yearly, a thermal growing session of 200 to 220 days, first frost late october or betoning of november, last frost in the beginning of April. So it is not tio bad in Southern Sweden.